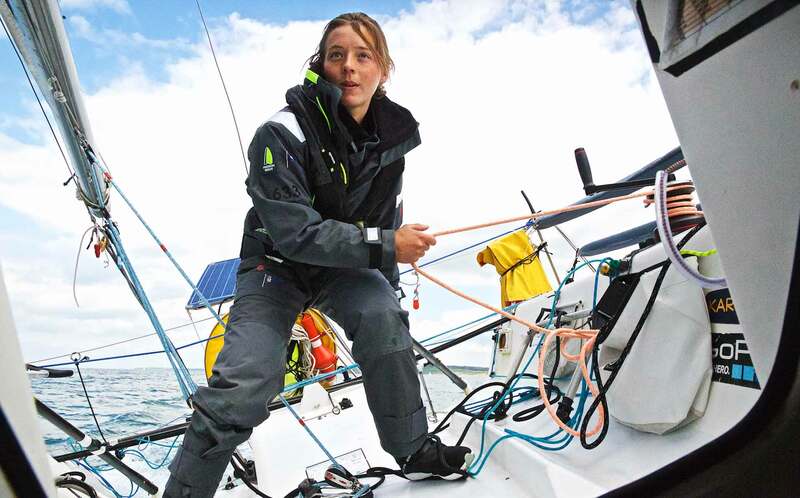 MiniTransat solo sailing with skipper Lizzy Foreman. After having done an interview with Siggi, Raimund and Robert on their Trans-Atlantic voyage with a King´s Cruiser 33, my own boat, which can be read here, I am now very proud of having had the opportunity to talk to Pro-Sailor Lizzy Foreman: Quite an opposite view of how to sail the atlantic Ocean compared to the three spare-time sailors. Lizzy Foreman, that´s a name I am quite familiar with since she attended the Haute Route roadbike stage race through the Alps – one of the hardest and highest bike-races for non-pros in Europe. Lizzy and I, amongst some 350 other participants, completed the race in 2013 and I was quite excited reading her name in the starter´s list of this year´s MiniTransat Regatta. Transatlantic Regattas are quite a few of and the MiniTransat is one of the most interesting to me. Why? Because sailing solo is considered the hardest form of race-sailing in terms of physical and – more so – in terms of psychological requirements. And if being alone in the midst of the vastness of the ocean and having to race against others, against oneself isn´t enough, this race is done with Classe Mini-boats. Just 6.50 meters of boat. If you find your 33 feet-cruise is too small for your demands? An 18 feet-boat would be only some feet more than a small nutshell. 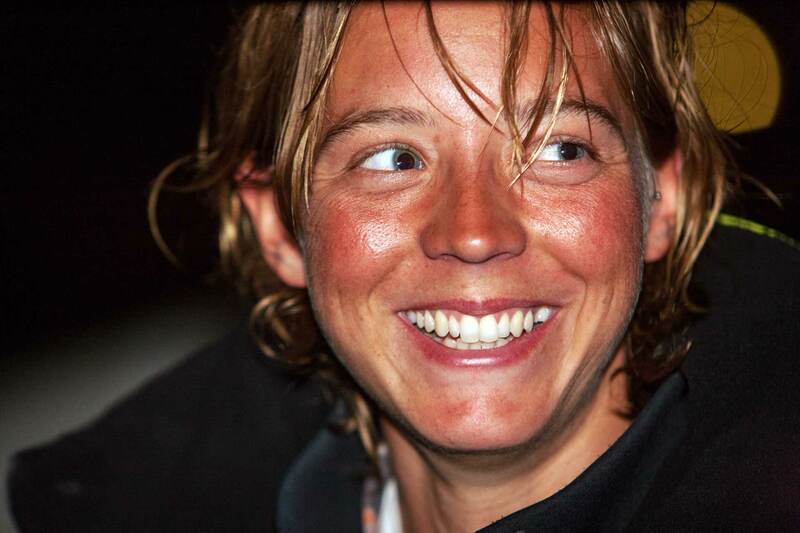 Lars Reisberg | NO FRILLS SAILING.com: Lizzy, first of all, my congratulations for the completion of this year´s MiniTransat! Some 2.500 to 2.800 miles of solo-sailing all across the Atlantic Ocean – what is the first thing that comes to your mind thinking of the race? Lizzy Foreman right after making landfall in Guadeloupe. Lizzy Foreman: At the moment, the first thing that comes to mind is a cracking headache – I haven’t really slept in over 18 days, and upon arrival, there is a mountain of things to tackle – like answering all the media inquiries, boat cleaning, repairs … so much stuff on my to-do list. But the overwhelming feeling is one of joy. I loved every second of the race, and I will always remember the endless days and nights spent surfing the waves. I have never seen a night sky as that in the Transat Regatta – glittering stars, a full moon – it was bliss! NFS.com: How many times did you cross the Atlantic Ocean before attending this race? And where´s the difference to previous races or cruises? 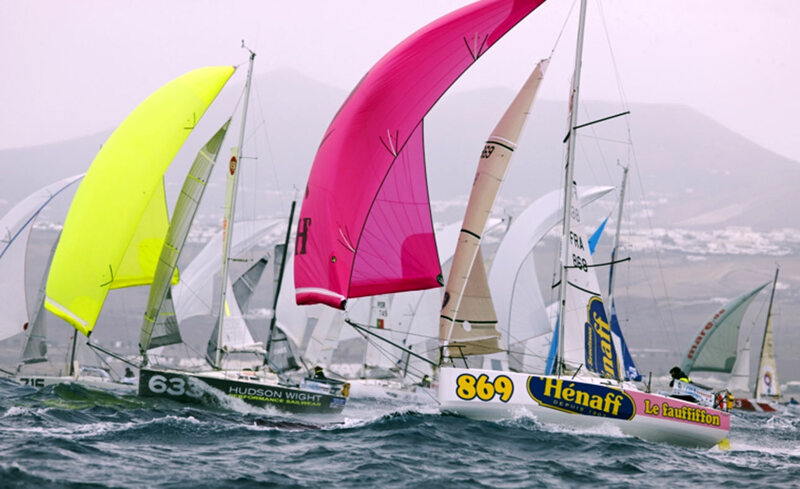 A hot start for this year´s MiniTransat Regatta. Lizzy: Sailing solo is always a challenge, whatever the weather or conditions. Crossing the Atlantic however is another game entirely! To succeed, firstly, you must be able to trust the boat with your life. One mistake and it can all be over. Your preparation has to be second to none – really, there is absolutely no margin for error. Then secondly, you really need to know yourself – how far can you go before breaking point? How much sleep do you need to perform? Can you take the isolation? The competencies span many areas – it is almost as if you learn parts of many professions and stitch them together to provide yourself with the skill set required: Navigator, doctor, nutritionist, psychologist, boat builder, sail maker. It´s a great variety needed here. NFS.com: Can you describe a normal day at sea? Do you have a certain schedule to follow? Is there spare time and if so, how do you spend it? Lizzy: Yes, of course! I did end up with quite a regular routine onboard: As usually done in Blue Water sailing, I lived in UTC-time, which meant I took meals at regular times, had a VHF-call at 0600 and 1800 every day to relay my position to any boats close by and I took the weather forecast at 1200 every day. That´s pretty much a normal day. But there are also implications by nature and ocean here: I started to learn the pattern of the wind shifts, so I would spend the mornings on starboard tack, gybing onto port when the wind became more easterly, gybing back to starboard in the evening. There were also tell tale signs for when a squall was about to hit, often early evening or midnight. Concerning spare time: There wasn’t a lot of to be honest – whenever the wind was below 16 knots I was busy repairing sails – in the end I had torn all three of my spinnakers – or catching up on sleep. During the last four days of the race though I did get really stuck in to a good book. The wind was pretty light and I had no spinnakers to trim, so I took some pleasure time here. There weren’t too many surprises from sailing the Atlantic, but on the other hand everything was just more pronounced I would say. The swell was bigger, the winds steadier, the cloud patterns very vivid, and the need to push yourself to perform more intense as expected. NFS.com: You mentioned the wind shifts and regular patterns. Can you tell some more about this topic, explain the trade winds? Lizzy: Well, to really keep track of the shifts it was best to sail on compass-mode when not helming, rather than true wind-mode. The shifts weren’t always regular but sometimes would shift by about 30 degrees. Speaking of the trade winds: Getting in to the blow really is the tricky part. For the 2015 MiniTransat there was a huge high pressure-system in the Mid-Atlantic resulting in very little wind to the North respectively on the direct rhumb-line. This meant the fleet had to take a very southerly route: Here´s the hustle. You go too far and you lose out massively in terms of extra distance. So every day you had to decide how far south to go to just skirt the edge of the low winds. Tough decisions here … But picking up the trade winds in the end was just a great event! I was able to sail on starboard tack most of the time, in a fairly predictable 15-20 knots, in corridors between the clouds. I still have a lot to learn about meteorology but it is true that the clouds can give a lot of information: The sky is exceptionally clear over the Atlantic so it is “just” a case of decoding the information that is there. For me sailing in the trade winds was just like sailing at any time offshore – yes, sometimes it is boring, other times it is the best place you could ever be. Whether you become bored or not is just a personal thing. I was pretty busy most of the time fixing sails, trying to sleep, drying clothes and doing stuff needed. I did have music playing about 12 hours a day to keep me motivated, and if I wanted a break I would write in my log book or read: I got through 2 magazines and 4 chapters of a book at finish line. Blue Water sailing with a tiny 6.50 dwarf? NFS.com: Provisions: Do you have a strict diet to follow whilst underway? Do you cook onboard or just eat NASA-style astronaut´s prefab-stuff? NFS.com: Who makes the strategic decisions while underway? Did you decide or did you have a staff back home? I would also like to know more about pre-planning this regatta and all stuff related to “how can I win this race?”. Lizzy: Well, to clear this first, I do manage my campaign independently due to being on a very tight budget. Luckily I managed at the last minute to raise the funds to pay for some routing-advice, which meant I was able to take along a road-book with some suggested waypoints, what to look out for in the weather and stuff. However, the Classe Mini-rules dictate that no outside communication is allowed during racing. We set off with just a VHF-radio and there are no mobile or satellite phones all around. This means you are required to come up with your basic strategic plan before you set off, and hope that you will be able to pick up the weather forecast by SSB radio, which is not easy at all, along the way to update it. So really, once you cross the start line it’s all down to you … which is for most participants the most attractive of all MiniTransat-characteristics. I guess it is a bit different planning for a big race on a Mini 6.50 than doing the same for other racing classes. We are not allowed to receive weather information, have no live routing – which means there are no computers onboard – and we only have an SSB-radio and VHF. However, if you have the money, you can buy routing-programmes such as Adrena which can predict a course with weather files. Again, money will buy weather files predicting the wind for more days in advance. I took some advice from a meteorologist who used Adrena to plan a rough route. This gave me some waypoints to follow for the beginning of the race. I know before you set off where the trade winds are going to be or should become established, so it is just a case of finding the quickest route to them. With regards to swell, I just took what came, although if I knew a certain wind zone was going to be particularly rough then I would try to avoid it. But sometimes there wasn’t much choice. So really I just set off with a plan for the first 10 days of the MiniTransat-race, knowing that after that I would have to decide at sea which was the best route to take. Considering the location of your other competitors is a huge help. Well, if you know where they are … And in the end, if you are unsure where to go, you can just sail the “Great Circle Route” which is the classic shortest distance to the finish. One guy did that and finished 7 days behind the leader. Still, he had a fantastic journey and his boat was in good condition having sailed in the lighter winds. The Minitransat 2015 was full of speed, hustle and strategic decisions. NFS.com: Lizzy, tell us more about your boat, specifics and characteristics and how did such a small vessel behave whilst sailing on deep blue waters, in squalls particularly. Lizzy: I did sail on a 10 year old Pogo 2. This boat had just completed it’s third transatlantic voyage. It is 6.5 metres long – thus belonging to the Classe Mini – and is 3 meters wide. It raced in the series division of Classe Mini where other types of boats are mostly prototypes because in Classe Mini things like canting keels, rotating masts or lifting daggerboards are allowed. Speaking of squalls, well, they do appear very quickly if you´re not watching carefully. You can see the cloud formations changing behind you, the base of the clouds are much lower, the clouds themselves are grey. They are sneaky though. If you are asleep you can miss their approach although you feel the boat changing as the wind increases. You get a little speck of rain just before the big downpour: Not much warning! NFS.com: So, what was the most stressful moment of the race. Also in terms of your “personal breaking point” you mentioned before: Did you reach it or went farther? Vice versa, the most exciting one? Lizzy: The most stressful times were always when the squalls came. Looking behind to see huge, looming black clouds above mountainous waves was just terrifying. The rain would fall, softly at first, then hammering down! The boat could be over on it´s side in moments, leaving me clinging for dear life to the guard rails! I quickly learnt to drop and lash down sails just in time before the squalls hit. On this race I didn’t push myself enough. I didn’t reach my breaking point, having come very close to that during my qualification and through other endurance events such as “our” Haute Route cycling race. I feel this was because I destroyed all three of my spinnakers early in the race, so I couldn’t sail the boat at it’s maximum – the gennaker is a sail just a bit bigger than the jib, that furls up. My speed was rarely more than 9-10 knots over ground. And so, once you know your boat speed is comprised, it is very easy to fall into a “cruising mode”. 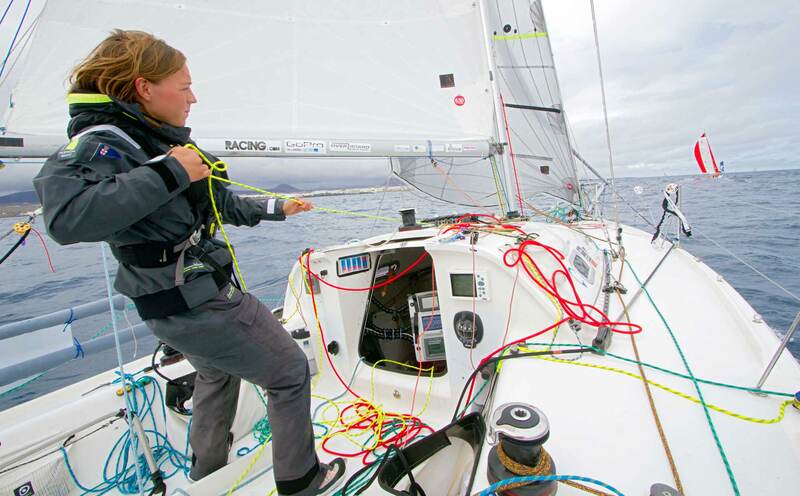 Sailing shorthanded and alone: Lizzy is a true master of her boat. You feel uncompetitive and don’t have many options to overtake. However, hearing my position on the SSB or seeing a boat on the AIS would make me realize I was still in the race. I still really struggle with sailing at night. I sleep a lot and found it hard to break the habit of sleeping my usual hours. Of course, waking up to check what was out there was a matter of course. 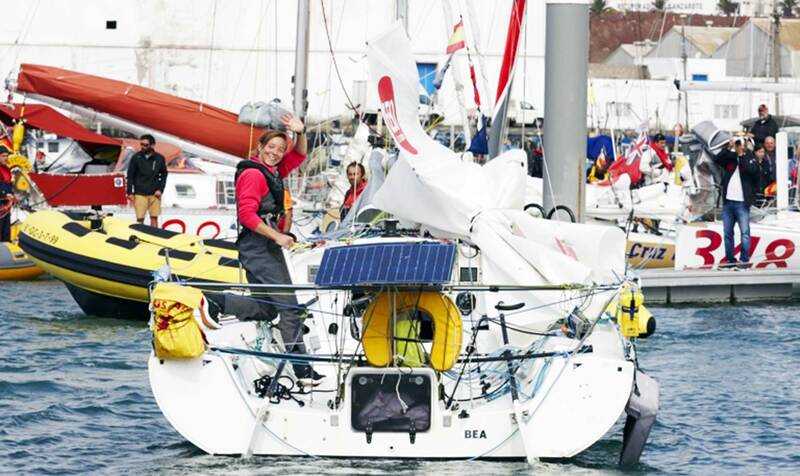 But I went back into the sleeping bag quickly … The most exciting times were always whenever a competitor would burst onto my AIS screen, or the radio would crackle with some inaudible French. Just knowing that there was actually somebody else out there would be enough to remind you that you are in a race, let alone sailing solo across the Atlantic. I really hope to do this race again in 2017. And I am certain I would try to sail differently. NFS.com: So Lizzy, what´s up next – a Vendeé Globe? Volvo Ocean Race? What can we expect to see from you in the (near) future? 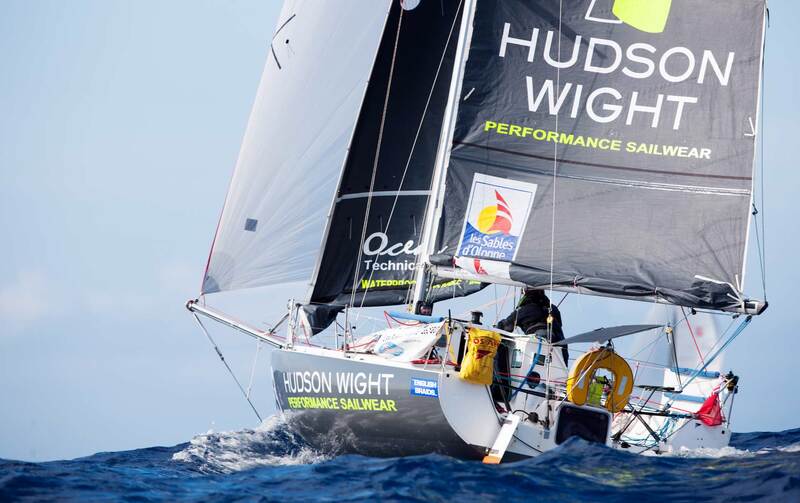 Lizzy: My immediate goal is to complete another MiniTransat next year and another Les Sables Azores-race in 2018. I just absolutely love Mini-sailing and truly believe it the best place to learn about offshore sailing. Alongside this, I would love to race in the 2017 OSTAR and the 2018 Route du Rhum in a class 40. Ultimately, I want to race in the Vendee Globe – but that´s a long way to go still because I still have a lot to learn. A lucky sailor arriving in the Caribbean. NFS.com: To draw this interview to close, what would be your top 5 hints and advice for newbies in Atlantic-Crossing? Lizzy, thank you so much for sharing your expertise and thoughts of Atlantic-sailing and the MiniTransat in particular! I wish you all the best for the upcoming projects, always a safe journey and a great Christmas-time with your beloved ones. I do look forward to talking to you again. 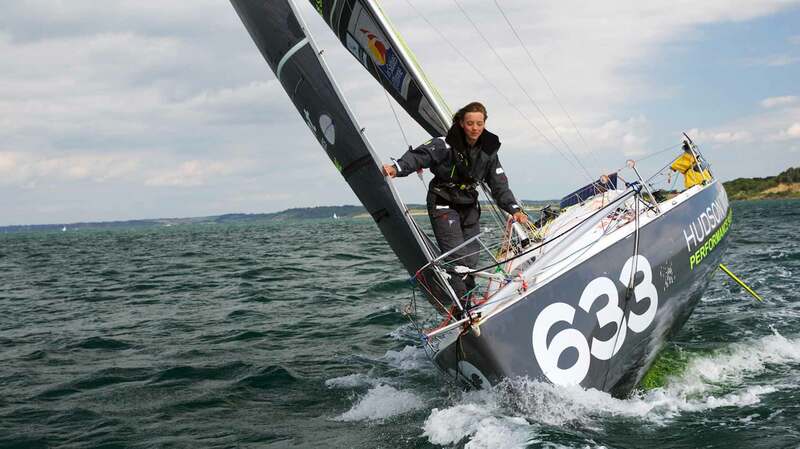 And who knows – maybe next time a best female sailor or winner of the upcoming regattas. You may browse to Lizzy´s website for more information, stories and event-dates. You may also be interested in browsing to the official MiniTransat-website as well. Hej, again getting mentioned in Sailing Anarchy – now for this very nice story! Please keep going, Knut. Very interesting… and great site !! Especially interesting since I’m planning a trans-Atlantic (still thinking about the boat… reading your article on the Pogogo 12.5). Keep it coming ! Previous Post	Classic marine instruments of brass.